Another thing: I don't like the solutions from sparkfun levelshifter site because most of them are pretty slow. Better use a voltage divider with two resistors per line as described in SimpleSDAudio.h. This is proven to work even at fast SPI speeds as required for my lib. if you really want to test this.. I suggest grabbing a few resistors.. and making a voltage divider, so that your LOGIC level will work correctly.. I have read about the voltage dividers being 'slow' (or too slow even).. but I have tried and tested this myself.. and it works fine for me & initial testing. A voltage divider between Arduino & SD card. MISO does not need a level shifter. I think both voltage dividers will work, if you don't have those 1.8k and 3.3k resistors also the 10k/4k7 solution should do it. BUT: Do you really have a CrApDuInO+gizDuino+ (the plus version)? In such a case please tell me exactly how the menu item under "Board" inside Arduino-IDE is called that you use. I can help you to get it running even on such strange Arduino board but it will need some "special handling". Only 4.7k and 10k resistors are available with me now. The 3.3 volts pin on my crapduino outputs about 3.3 volts so it's correct. In my voltage divider with 4.7k and 10k, i get a 3.3 to 3.4 volts accross 10k. I use 1.0.3 IDE. Board: Gizduino (mini) with atmega 328. Programmer: AVR ISPmkII. Ok, at least this Arduino clone has a ATmega328, better than the one with the plus at the end. If you do your wiring correct and with levelshifters it should work with the lib. +3.3v output ON the +3.3v pin..
Level Shifters. One of the more important but rarely addressed subjects. for the record either the 3K9 or 4K7 resistors will work fine. There is a slightly different method that can be used to give true level shifting. 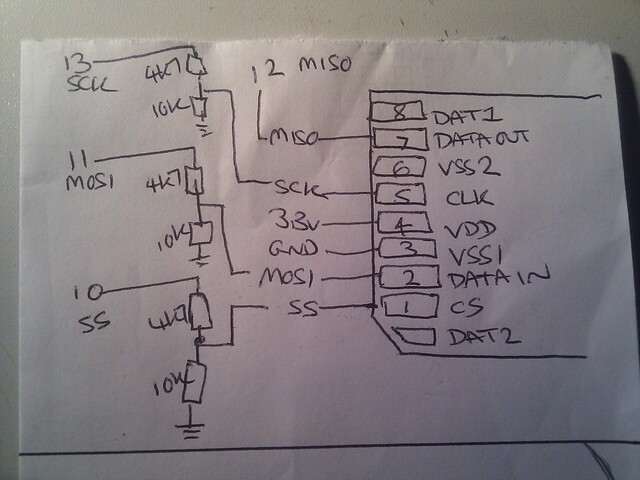 Instead of 2 resistors (Besides the bus pull-ups) a single mosfet is used. There is truly an added advantage in that the device is fully bi-directional it is described in this app note: AN10441. I have attached it to this post. basically the Drain connects to the 5 V side (data - I/O), The Source connects to the 3V3 side (data - I/O) and the gate connects to 3V3. I had a bunch of 2N7000's and for the 3 or 4 I've built they've worked well. A BSS138 is recommended for this device and 2 or more? should fit nicely on one of those small SMT prototype boards. I also chose the 2N7000's because I had a bunch of them but I've not found it necessary to "Select" devices to make functional 2 wire translators, all have worked and I also use them in preference to the BSS138 because I breadboard everything and interconnect and a test all of any modules before I have an idea of what the final PCB is going to be. As a note: Adafruit sells inexpensive level shifters for 2, 4, 8 channels but I've not bothered as it takes a fet/channel and a jumper not the 6 wires that breakout board does for 2 channels. and yes, level shift your pins. A simple resistor divider, as suggested, or you can use a 74HC4050 (CD4050 can be used if you can't get it locally). If I turn on the crapduino and upload absolute minimum, what readings should I get from this pins: D4, D11, D12 and D13 provided that I have not made any connection yet. are you using a level shifter? have you made a resistor based voltage divider?? follow the images/wiring that was posted for you. yes, I'm using a level shifter. I followed the second circuit. Resistor values are 4k7 and 10k. If I supply my level shifter with 5 volts, the drop across 10k with respect to ground is around 3.37 to 3.4 volts. This means that my level shifter is OK. If I turn on my crapduino, what voltage should I read from the SPI pins? Can you take a picture of your setup and post it here? Are you using an SD Card or a Micro SD Card in an adaptor? What's the error code thrown out by the BareMininumWithDebug example, error code: 1 or error code: 08? if it is error code 1, if your not using a shield, check your connections and contacts with the SD-Card pins. if it is error code 8, try level shifting using 1.8k and 3.3k resistor. I recently had a problem with my setup above using CD4050. So i ditched that setup and use resistor divider with above values. I am using a micro-sd on an adaptor. also if no error code and it is saying in the serial monitor "Initialising SD card...Wiring is correct and a card is present....... playing EXAMPLE.AFM.found.playing" lean-in, or put the speaker, closer to your ear, the audio volume is quite low. that it can be unnoticeable when your in a noisy environment.